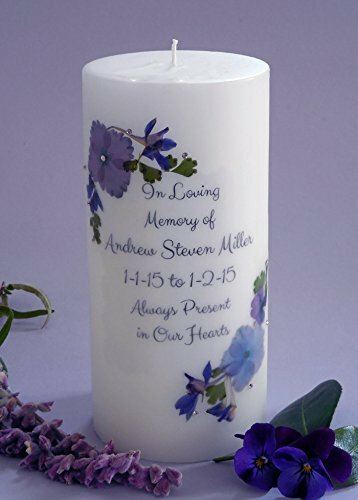 Our dripless memorial candle is handmade with brilliant Swarovski Crystals all around the candle. This traditional design gives a beautiful remembrance to your loved ones. Personalization is "In Loving Memory of...with up to 2 names...who is (or who are) present in our hearts." Made in our Northern California candle studio. 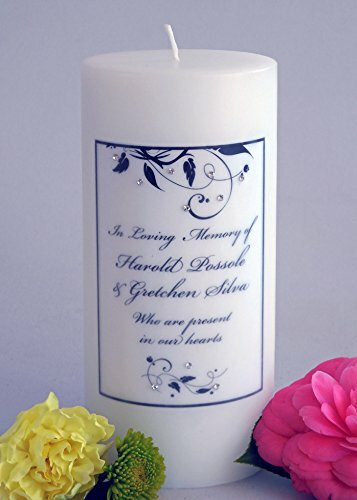 Our Violet Bouquet Memorial Candles make a beautiful remembrance for your loved ones. We use a variety of purple and violet flowers including purple hydrangea with a sprinkle of Swarovski crystals in a 2 corner design. 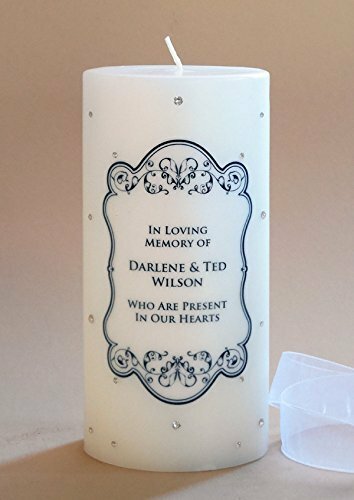 Includes up to 2 names centered in the middle of "In Loving Memory of...always present in our hearts." Includes clear wrapping and a color coordinated ribbon. Also choose our creamy white (shown) or light ivory candle color. Delivery within one week. Made in our Northern California candle studio. 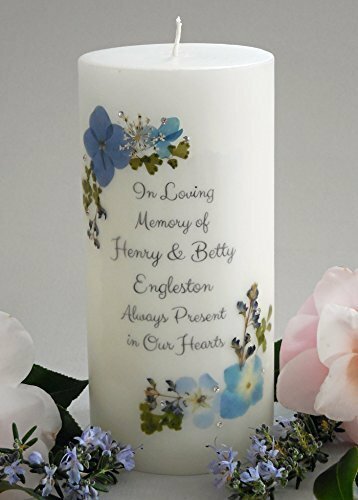 Our Blue Bouquet Memorial Candles make a beautiful remembrance for your loved ones. We use real baby blue eyes and blue hydrangea flowers with a sprinkle of Swarovski crystals in a 2 corner design. 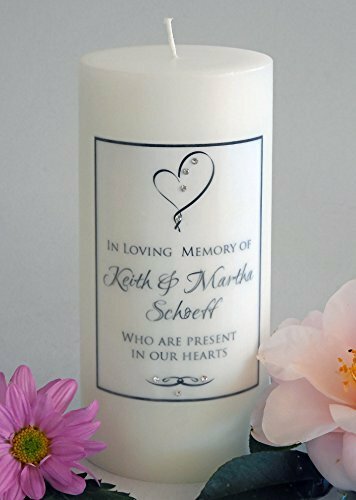 Includes up to 2 names centered in the middle of "In Loving Memory of...always present in our hearts." Includes clear wrapping and a color coordinated ribbon. Also choose our creamy white (shown) or light ivory candle color. Delivery within one week. Made in our Northern California candle studio. 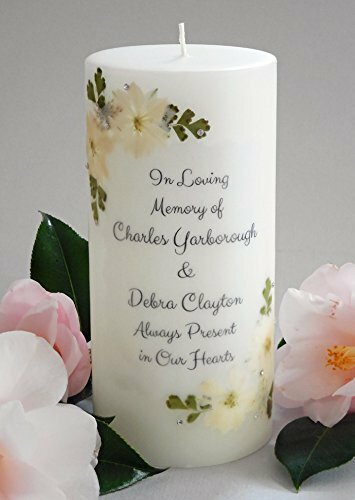 Our dripless Elegant Leaf memorial candle is handmade with brilliant Swarovski Crystals. This traditional design gives a beautiful remembrance to any wedding or event. Personalization is "In Loving Memory of...with up to 2 names...who is (or who are) present in our hearts." Made in our Northern California candle studio. 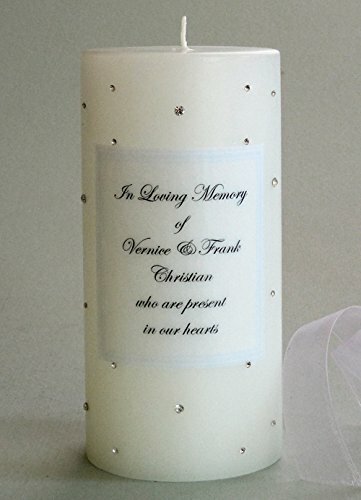 Our dripless Christian cross memorial candle is handmade with brilliant Swarovski Crystals. This traditional design gives a beautiful remembrance for your loved one. Personalization is "In Loving Memory of...with up to 2 names...always present in our hearts." Made in our Northern California candle studio. Our dripless Ribbon Heart memorial candle is handmade with brilliant Swarovski Crystals. This traditional design gives a beautiful remembrance to any wedding or event. Personalization is "In Loving Memory of...with up to 2 names...who is (or who are) present in our hearts." Made in our Northern California candle studio. 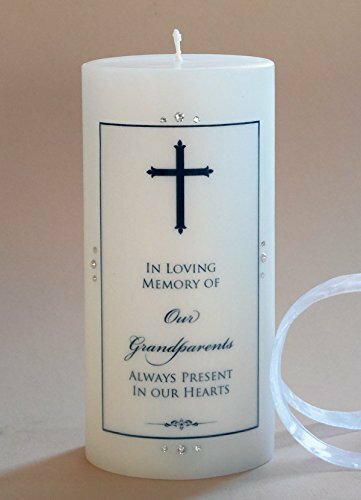 Our White Linen Memorial Candles make a beautiful remembrance for your loved ones. We use real white larkspur and add a sprinkle of Swarovski crystals in a 2 corner design. Includes up to 2 names centered in the middle of "In Loving Memory of...always present in our hearts." Includes clear wrapping and a color coordinated ribbon. Also choose our creamy white (shown) or light ivory candle color. Delivery within one week. Made in our Northern California candle studio. 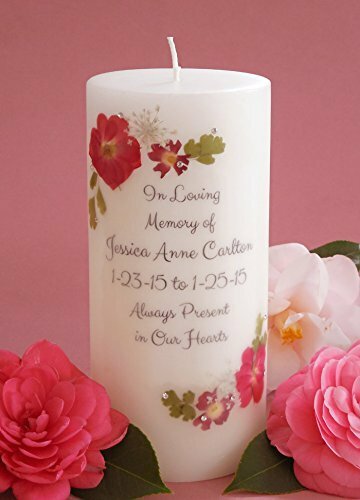 Our Red Rose Memorial Candles make a beautiful remembrance for your loved ones. We use red roses and red verbena and add a sprinkle of Swarovski crystals in a 2 corner design. Includes up to 2 names centered in the middle of "In Loving Memory of...always present in our hearts." Includes clear wrapping and a color coordinated ribbon. Also choose our creamy white (shown) or light ivory candle color. Delivery within one week. Made in our Northern California candle studio. Shopping Results for "Swarovski Crystal Memorial Candle"